Dollar Tree stores can occasionally be a source for some Little Weirdos-approved cheap toys (see here and here), but really great stuff doesn't surface there all that often. Well, if you're a mini figure collector, now is one of those times they actually have something worth picking up. A week or two ago I saw people posting about "Top Toupie" figures on Facebook, and the photos being shared caught my attention. Basically, these things are tiny figures (about half an inch tall) that come with spinning tops. The figures have little holes underneath that allow them to be plugged into bases on the tops, and then you can pull a cord through the side of the tops to make them spin. The idea is that you're supposed to pit two of the little dudes on their spinning tops against one another. Although, I don't really know how the outcome of a spinning top battle is judged. 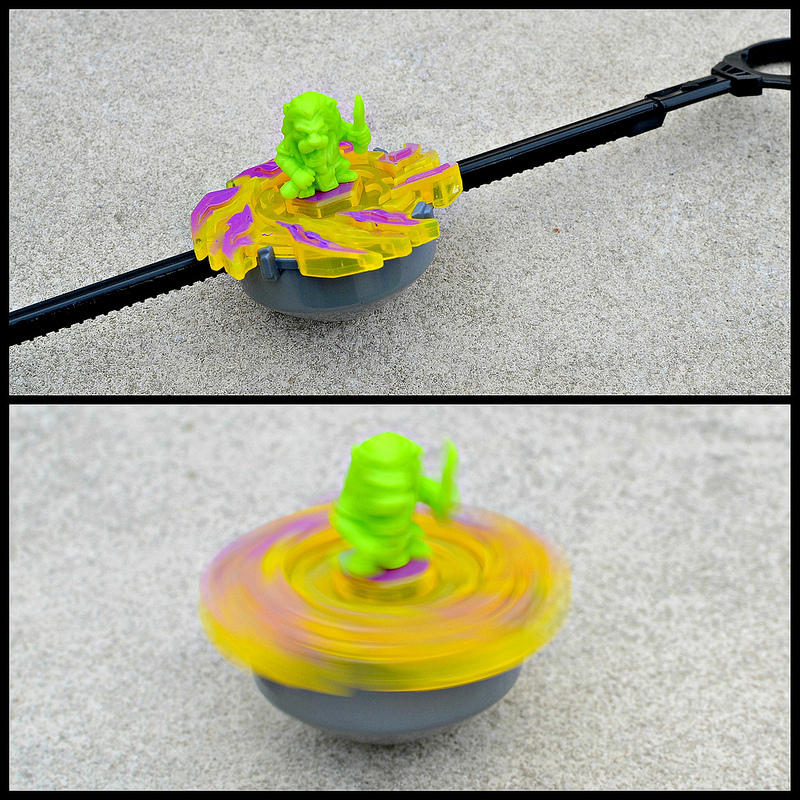 Whichever top stops spinning first loses?...damn it, I'm over-thinking cheapo dollar store toys. I'm not even sure if "Top Toupie" is an actual name for these. I Googled "Toupie" and apparently it means spinning top in French, so maybe the package just lists what the toys are in two languages. Also, "Toupie" makes me think of "toupée," which I believe is the first time a toy ever made me think of toupées. The spinning tops are cool enough, but if you're reading this, the main attraction here is no doubt going to be the mini figures. They're pretty detailed and nicely sculpted for being so tiny. Plus, they're monochromatic (always a plus in my book), and they're made out of a hard plastic, so those who aren't a fan of Trash Pack-like squishiness should have no problem with this material. The mini figures come in three different colors: orange, blue and green. At my Dollar Tree they only had orange and green ones for some reason (hence the lack of blue in this post). 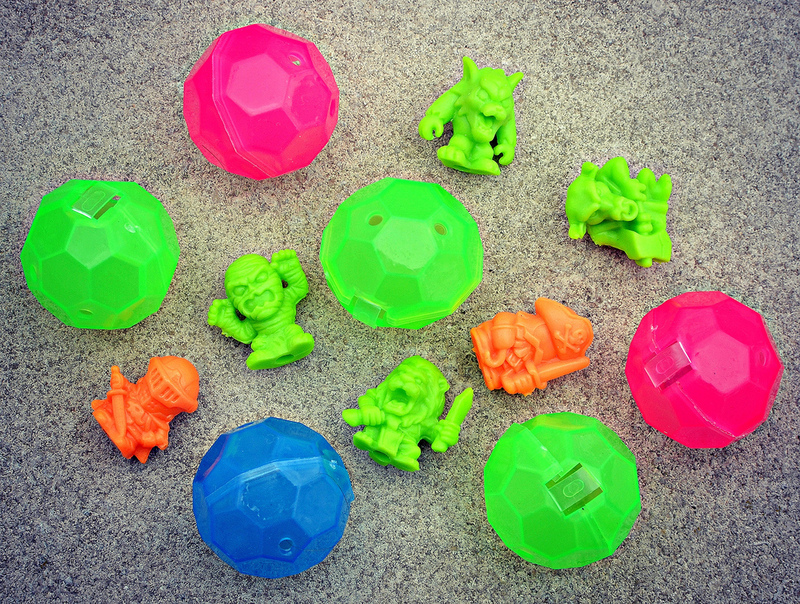 There are at least 18 different figures, with one figure and one top (plus two different neon-colored attachable platforms that connect to the tops) in each package for $1. Each figure seems to only come in one of the three colors. Characters include a mix of monsters, hero types, sports guys and more. The six I picked up are a mummy, a werewolf, a lion-man, a minotaur, a pirate, and a knight. Others available include a ninja, a punk rocker, a boxing kangaroo, a luchador, and a sumo wrestler (click here for a photo showing the 18 different sculpts that have been identified). The tops actually work pretty well. They didn't fall apart while I was testing them out, and that's half the battle right there when it comes to dollar store toys. The packages also include translucent neon plastic "pods," I guess meant for storage of the figures when they're not taking part in spin battles. So yeah, overall I dig these. I can think of much worse ways to spend a buck. Next time I'm at Dollar Tree I'm sure I won't be able to resist the temptation to pick up a couple more. I'd like to get my hands on that boxing kangaroo. What about you? Have you seen these? Did you buy any, or are you planning to on your next trip to Dollar Tree? I was at my local dollar store just the other day and did not see anything nearly as cool as this. I will have to keep my eyes peeled. That boxing Kangaroo is a must have for sure! Good luck! As far as I know these are at DT stores in all locations. I'm not a huge fan of most of the sculpts, but I do dig the animal-men and a few others. I personally have only been able to find the werewolf and the same orange knight in a different pose. (Along side that dumb skater kid). Yeah, the anthropomorphic guys and the monsters are best ones. I saw the skater kid too and didn't buy him, haha. I was at a DT over the weekend and didn't see these. Gonna have to be on the look out. Found them at one in the burbs. Let me know if you need me to pick any up for you next time I am there. I ended up getting ahold of some of these yesterday jumping from Dollar Tree to Dollar Tree and I gotta say: these little guys are wonderful! I absolutely love the Minotaur and Lionman, they're just wonderful little wierdos. I'm curious as to what possessed the company that made these to make these figures with their dollar store tops, but whoever thought it up I salute 'em. First, there's a second toy in Dollar Trees called Top Toupie, that's a spinning light-up top without a figure, which the only thing I can find for across the whole internet that shows it (as I had no interest in buying one) was this video on Youtube: http://youtu.be/5rv2HbCYAak?t=2m37s I didn't bother to look at the top at the store and see if the same company made it, which I kind of regret now. Secondly, in the last Dollar Store I hit on my little hunt for these guys I found Top Toupie stuff and got excited because they had a good 8 pegs of them, but, oddly, none of them had the minifigures in them: the little bubble at the top of the pull-string where they normally are were all empty. Rather odd. I hope this is just some early run and not an actual running change that'll mean that all future restocking of these guys go minifigure-less, yikes! Thankfully, all the other stores had plenty in stock with plenty of little minifigure goodness: although, sadly, I couldn't find a boxing kangaroo myself, either. Dangit, I will have that kangaroo! The Minotaur and Lionman are two of my favorites as well. Yeah, when I got these and then searched for "Top Toupie" online, I saw the top-only things you're talking about. Hmm. That's very strange that you saw entire pegfulls missing the mini figures. Maybe just a factory error and a bunch got shipped out without them? Whoa! Am heading over to both of the Dollar Trees we have in the area and check and see if they have any of these. Stopped in there yesterday on the way home and sure enough they had a few in stock but i didn't have any extra cash on me and i was in a hurry but i think i will swing in there this weekend time permitting. Wow, these little guys are great! You never know what you might spot at The Tree. Sometimes you can find some pretty sweet stuff! I definitely want to grab at least a couple of these guys. I still miss the days you could find big bags of plastic fantasy figures at dollar stores, but yes, there's still some decent stuff once in a while! Nice! Yeah, I was a bit surprised just how tiny they are, but they did pack in a good amount of detail considering.